Original Black Sabbath Drummer/Member BILL WARD on VH1's Hit Series . 'THAT METAL SHOW' with Eddie Trunk & Cast. & 'On AWicked Night' will be released as 7" 45 single with Picture Sleeve. 12" Vinyl LP for DETH RED SABAOTH with Color Lyric Sleeve. It will be limited to 2000 copies on Black Vinyl & 1000 copies on Red Vinyl. & is sure to Sell Out as have all of the Most Recent DANZIG So Cal Shows!!! due to problems with the Venue. Most are for "BLACKEST Of The BLACK 2010 Tour"
More Live dates for California will be announced later this week. Making this DANZIG's only Top 40 placing since DANZIG 5 . The Single "ON A WICKED NIGHT' debuted at #6 on Billboard's Top Singles. DANZIG is currently editing the Music Video he Directed for "ON A WICKED NIGHT". It was shot On Location in early June at the Infamous 'BatCave' in the Hollywood Hills. We've posted a Still above from the Forthcoming Music Video. the 1st 'New 'DANZIG Material in 6 Years. These Live dates will be the 'ONLY 'US Dates until the Late Fall 2010 BLACKEST Of The BLACK Tour. on APRIL 24 from 2-4 pm for his "HIDDEN LYRICS "book with Illustrations by SIMON BISLEY. There will also be an In-Store Signing for "HIDDEN LYRICS" in HOLLYWOOD,CA. at GOLDEN APPLE on MAY 2. 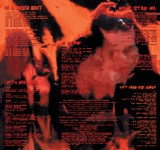 "HIDDEN LYRICS OF THE LEFT HAND"is now Available Here & on the VEROTIK Website. Check back next week for News on Upcoming DANZIG US Tour Dates. Phoenix Arizona's KUPD U Fest on April 24 . Go to the Live Page for More Info. and SAUNA OPEN AIR Festival in Tampere, Finland on June 11.
as well as Select Comic Shops. It will also be available Here & on the VEROTIK Website. 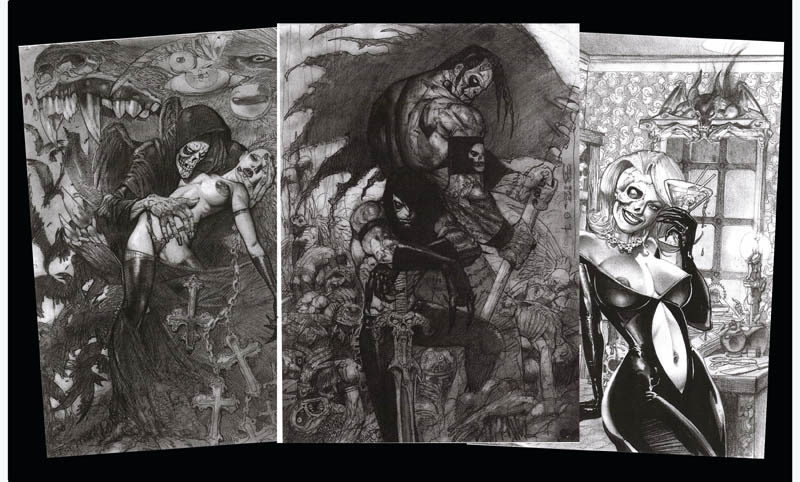 We can confirme that Simon Bisley has completed his final Illustration for the DANZIG Lyric Book. 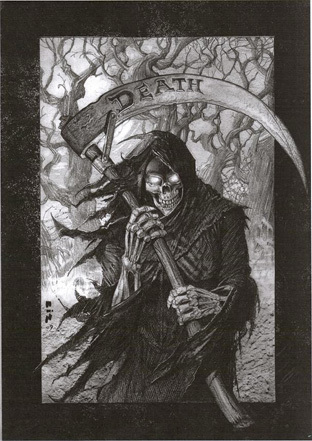 We have pictured it below & it is for the Danzig Song "When Death Had No Name". Will post an actual Release Date here once we have it. 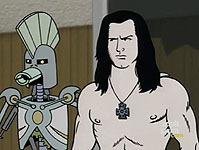 Meanwhile DANZIG has been in the Studio, hard at work, on the Next DANZIG Record. We know that both Johnny Kelly & Tommy Victor will be on most of theTracks. played Guitars on 2004's "Circle Of Snakes". DANZIG have added Two More Live Dates in Southern California. in San Diego at HOB on Feb.23. Check the Live Page for More Info. DANZIG will be Headlineing MUSINK 2009 on Sunday Feb 22 at the Orange County Fair & Expo Center. "Another possible California Live Date may be added. ensure a Great 20th Anniversary Live Set. 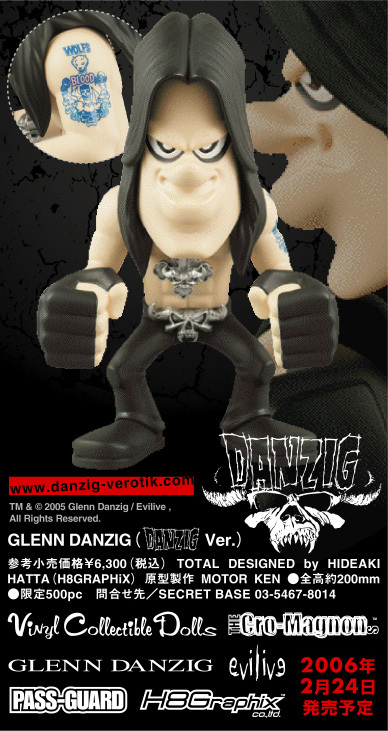 here on the Official DANZIG Site. and many other subjects along with some photo's of the Man himself. Believe it or not but this is a First for the Official DANZIG Site. "PHOENIX DATE ADDED FOR BLACKEST 2008"
Another Show has been confirmed and added for "BLACKEST Of The BLACK 2008"
It will be on Monday NOV.3 in Phoenix, AZ. at the Marquee Theatre. Dates have been confirmed and posted for "BLACKEST Of The BLACK 2008"
on both the DANZIG and BLACKEST Of The BLACK Sites. This is the longest Tour DANZIG has gone on in over 2 years. Tickets should be On Sale shortly for All these Shows. with the 20th Anniversary of the release of the 1st DANZIG Album on Def American. DANZIG has not done a Full US Tour in some time and who knows when he will again. and do the Live Show for all the People who've followed My Music all these Years". as they are one of my Favorite Bands and always wanted them on BLACKEST Of The BLACK. Should be an INCREDIBLE 20th Anniversary Tour." or the Live Dates page of this Site. Yes, you heard it, so stop emailing and calling. for TERMINATOR:The SARAH CONNER CHROICLES. Now DANZIG Tracks have the Distinction of being played at both the World Series "SACRIFICE"
and at the Super Bowl "MOTHER". DANZIG' Vinyl Collectors will want to Reserve their Copy of the Upcoming Ltd. Ed. 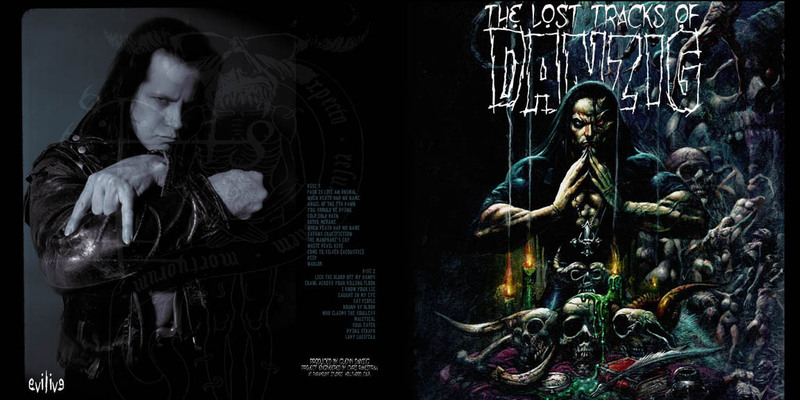 Double Disc LP Release of "THE LOST TRACKS OF DANZIG"
Tracks that never had their DarkVerses printed, well wait no more. 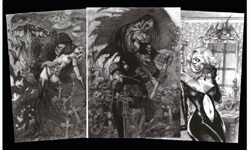 GLENN DANZIG's Song Lyrics Illustrated by "the Biz" Simon Bisley. long time DANZIG collaborator and Friend SIMON BISLEY. Release is set for Late Spring 2008.
and the cover for DOYLE 's Solo Project "GORGEOUS FRANKENSTEIN ". DANZIG has added a Final Live Date in San Diego, Ca. at the Viejas Casino. DANZIG will be joined OnStage for these HALLOWEEN Live Shows by . and Returning on Guitar is Former DANZIG member TODD YOUTH. An extra Live Date for the fans in Albuquerque,NM has also been added. .
West Coast DANZIG Live Shows have been posted on the Live Page. where it will be HIGH ON FIRE instead of HORROR POPS . in a Gatefod Sleeve with 8 Page Booklet..
Haven't forgotten about all you Vinyl Collectors. 4 DANZIG East Coast Live Shows have been posted on the Live Page. Doyle's New Solo Band "GORGEOUS FRANKENSTEIN" will be on all the Shows. Hope you checked out DANZIG in the latest SPIN, STUFF and HAILS & HORNS magazines. 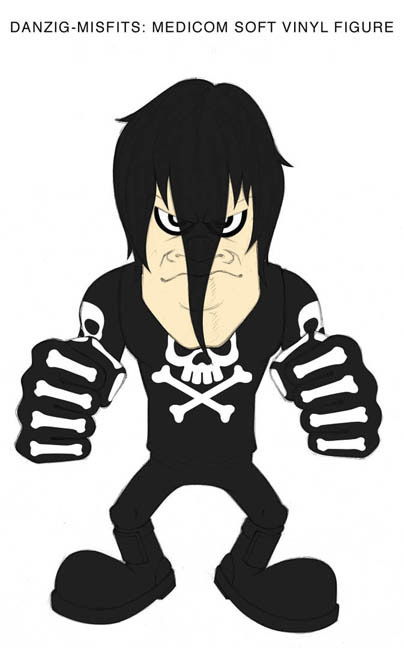 DANZIG will be Announcing a handful of East Coast Live Shows for the week leading into Halloween. Looks like NYC, Philly, Baltimore and Possibly Worcester/Boston. West Coast Halloween Shows may also be added. DANZIG has said he will perform a few songs from the New "Lost Tracks" Double CD at these Shows. Fans don't want to miss these Shows, as they will be the only ones for a while..
Release Date for DOYLE 's "GORGEOUS FRANKENSTEIN " CD is set for Oct.2. Get ready for DANZIG's brutal "DRUKIJA, Contessa of Blood" later this Month. Contessa Drukija brutalizes and tortures young virgins, drinking and bathing in their blood. and is Illustrated by long time collaborator SIMON BISLEY. and the upcoming cover for DOYLE 's Solo Project "GORGEOUS FRANKENSTEIN ". The DRUKIJA book is a Limited Edition so you might want te reserve one before they are all gone. Gatefold CD Package . Unavailable for several years this Special Edition has also been ReMastered. Vinyl Fans should be on the lookout for LP and Picture Disc Rekeases of BLACK ARIA II. All these evilive Releases are Available May 15, 2007. 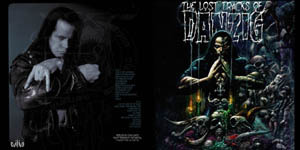 The Long Awaited LOST TRACKS OF DANZIG 2 CD set will be released on May 29th. anecdote about each song as remembered by GLENN DANZIG. Drums with DOYLE on 'His' First Solo Project since leaving the Misfits ,"GORGEOUS FRANKENSTEIN". DANZIG is Producing for DOYLE. Will post a jpg of the Lost Tracks Cover this week. release of the Original BLACK ARIA which is coming back into Press..
surprise Bassist on the "Blackest of The Black" Live Dates. "I'm looking forward to being OnStage with Glenn again and seeing all the Fans"
Zing stated, " It's gonna be a Blast". DANZIG has agreed to perform on 10 West Coast "Blackest of The Black" Live Dates. "This is sort of an experiment for me" DANZIG explains"To see if I can deal with doing 2 or 3 shows and flying home afterwards. 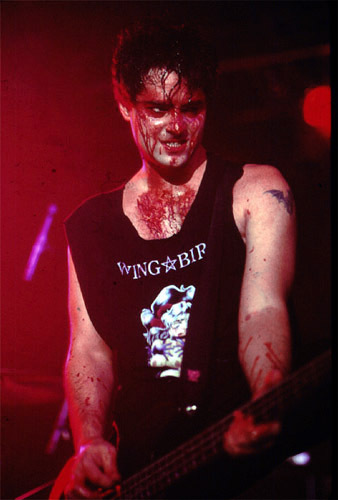 If this works then maybe more Live Shows for DANZIG could be in the future". Go to www.blackestoftheblack.com for full line up and live dates. DANZIG is pleased to announce that Kenny Hickey (Type O Negative) will be joining fellow bandmate Johnny Kelly Onstage as new DANZIG Guitarist. in Hollywood at the HENRY FONDA THEATRE. Tickets are On Sale now. Be there. to announce. First Time DANZIG has been back to AUSTRALIA since 1993. WOW!!? 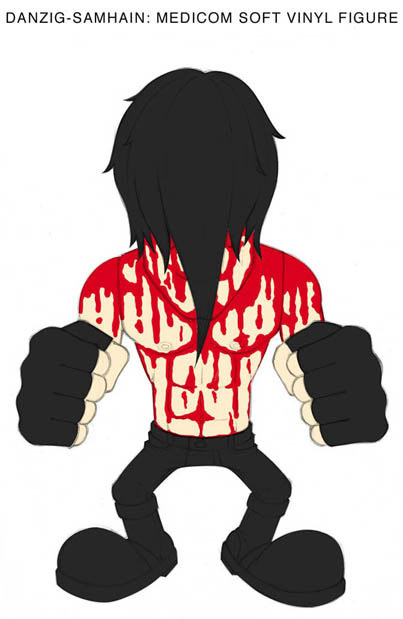 covered in Red Dripping Blood just like the Gore ole days. How BLOODY Sweet is That?? The next to be Released will be the DANZIG "Danzig-Version"
and dangling Upside-Down Cross Necklace Medallion. These Toys are Limited Editions so please make sure you get one before they are all Sold Out. comes in the "Ghoulest" Box that features an Upside Down Cross see-thru Front. 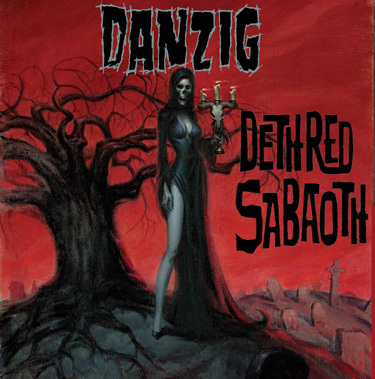 The next to be Released will be the DANZIG "Samhain-Version"
dripping with Blood ala the Initium LP Cover. 10th Anniversary Strret Fair in Long Beach, Calif. Saturday Nov.12 at 4:00 PM. JESSE and DANZIG go way back as anyone who's seen the Mother'93 Video knows. Greenbelt Park Beautification, City of Long Beach. Wednesday night 8/28/05 DANZIG and DOYLE will be guests on CHAOS the metalshow on Indie 103.1 FM Los Angeles from 10pm-11pm PST. to recover from all the damage. We hope all our Friends there are safe and wish the City and its People a Speedy Recovery. FOR "BLACKEST OF THE BLACK" 2005"
DANZIG Live Dates have been posted on the Live Page of this site. and on the "BLACKEST of the BLACK" Website. All Dates will include Special Guest Set w/DOYLE. DANZIG is also offering Fans Pre Sale Purchase of Tickets at reduced Service Fees. Go to the Live Page of this site and scroll to the bottom for more info. 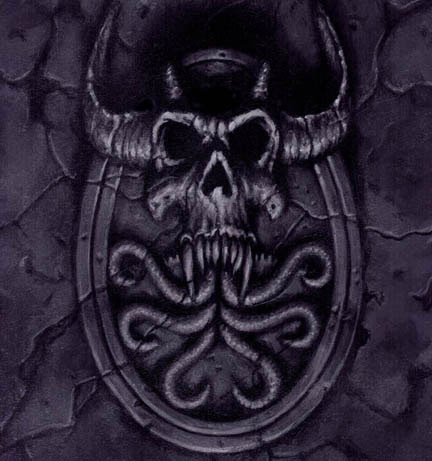 NEW DANZIG DVD "IL DEMONIO NERA"
The New DANZIG DVD "Il Demonio Nera" will be In US Stores JULY 12, 2005. 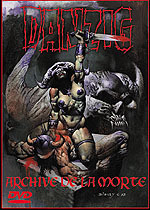 The New DANZIG DVD "Il Demonio Nera" will be released Spring 2005. We have posted the Advance Poster to the right. DANZIG will be giving out a Limited Number of this Poster for free each night on the"Circle Of Snakes" US Tour until they run out. The DVD includes Rare and Unreleased Music Videos from '94 - '97. Some have never been seen before this release. When we have the actual Street Date we will list it here. DANZIG has now agreed to also add some European Live Dates starting in late March. Check the Live Page for Updates this week. We are also pleased to announce that Johnny Kelly of Type O will be returning on Drums. for "I LUCIFERI" and the 2 "Blackest" Shows. Definately Not Worth Missing!!. for one of the Tracks. Now that will be Wild!! DANZIG has agreed to do a Month of US Live Dates starting in late Feb. The First Week of Dates have been posted on the Live Page with More TBA. European Dates are also being considered for late March. Both LA New Years Dates w/Doyle have SOLD OUT. If you do not have Tickets your only chance is Las Vegas which is also nearing Sell Out. Thanks To All for making these Special Shows a Success. Have a Great and Safe Holiday!! 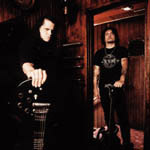 DANZIG has added another L.A. New Years Date on Wed. DEC.29 at The KEY CLUB. We suggest Purchasing Tickets soon as The Wiltern Date has SOLD OUT and seating is much more limited at The Key Club. has been completed and it is now in the Mixing Stages. Release is set for Spring/Early Summer 2005. 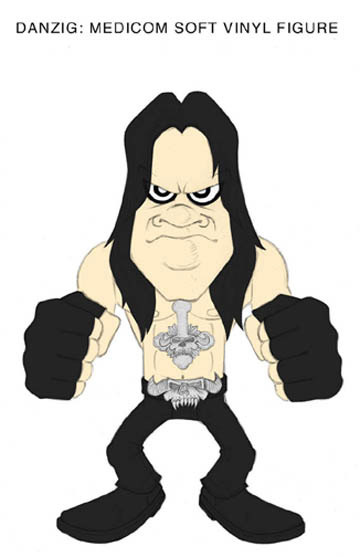 DANZIG is also considering a short US/European Tour in the Late Feb./Mar. Time Period. With the Blackest Tour being pushed back to Fall 2005 that would leave 'no' DANZIG Circle of Snakes Tour. If he decides to Tour we will Post it here and the Dates will be added to Our Live page. 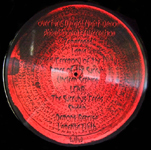 "CIRCLE OF SNAKES" Limited Ed. 12' Vinyl and Picture Disc have been Released in Europe by evilive/Regain. 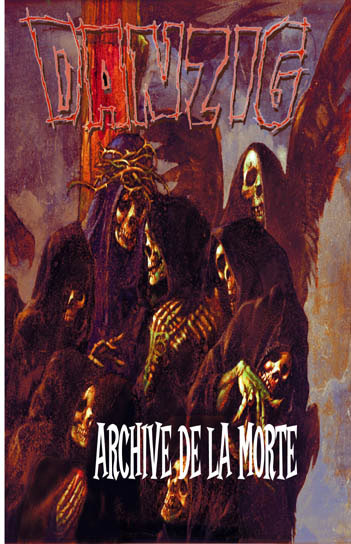 Also the DANZIG "ARCHIVE DE LA MORTE" DVD has been released in Europe by evilive/Regain and Features a Bonus Live Track of "Left Hand Black". 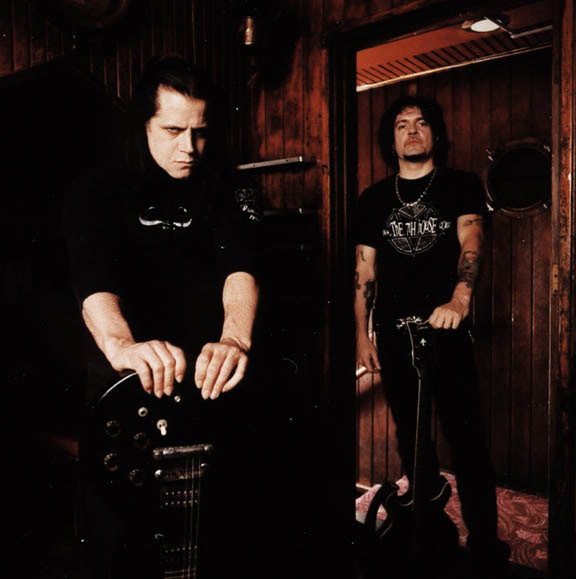 DANZIG & Tommy Victor will also be featured in an Upcoming Issue of Guitar Player Mag. DANZIG is finally going into the Studio in Nov. to start recording his BLACK ARIA 2. DOYLE will be Performing a Special Guest Set w/DANZIG on these Dates. This will be the 1st Time they will be Performing together on Stage in 20 Years. WOW!! THIS IS HISTORIC... We advise you to get your Tickets Right Away!! 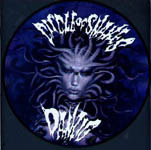 The NEW DANZIG CD "CIRCLE OF SNAKES" will be available last Week of August . The 1st Press comes w/Ltd. Slip Cover. DANZIG will also be hitting the Road w/BLACKEST OF THE BLACK for what may be the Last Tour, at least for awhile as he prepares to Direct his First Film Feature. from MEDICOM Toys in Japan. They will be Released 1 at a time. DANZIG will be heading into the Recording Studio sometime in Oct. to start recording the 8th DANZIG album. at the Forum. Some Live Dates in Sweden and in Italy are also planned. The New DANZIG CD is scheduled for a SPRING 2004 Release. The wait is over... finally, the long unavailable music clips from "How The Gods Kill" and "Thrall" plus Unreleased Clips and alternate versions of songs you never even knew existed... All on one DVD. Look for it across the country on May 6th from MVD Video. And to commemerate the release, Danzig will be doing an instore at Tower records on Sunset Blvd. in Hollywood CA on May 1st! DANZIG himself will be signing autographs on May 1st from 8 to 10 PM. So come get your advance DVD's and posters 5 days early! "CYBERNETIC GHOST of CHRISTMAS PAST from the FUTURE"
check local listing for airtimes or go to the CARTOON NETWORK website. Say hi to SATAN CLAWS!! We have also added lots of live shots from the I Luciferi Tour in the Photo's section. They are from The World NYC June 28th 2002 and The Grove Anaheim Aug 4th 2002. Taken by Crazy Craig. "The Blackest Of The Black" website will be up soon and will list all information as it progresses on this new Dark, Extreme tour that Glenn Danzig is putting together. 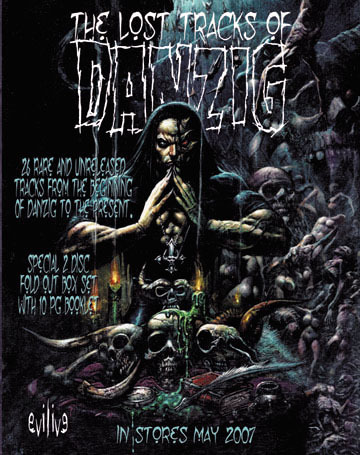 Danzig also have plans, before years end to Tour Europe and Japan. More info as we get it, Demon M.F.'s. Click over to the photos to see some pictures from the Wicked Pussycat video shoot, which is being edited right now. There will be two versions. One for an 18 and over crowd and one for a general release. Thanks to all you Demon M.F. 's for requesting Danzig and making the three song sampler the most requested addition in Metal radio according to Album network. See you on tour! The Danzig 777 I Luciferi US Tour is confirmed and starts on June 1st in Phoenix AZ. We have posted dates here on the Danzig site. Just click on the tour icon or click here. We will be adding dates every week, so check back regularly. As you are all aware the record has been pushed back by the label to June 4th. Very Lame!! But this Record and Tour will destroy anything that dare's stand in it's path! Let all who oppose be cast aside! See all you Demon M.F. 's on Tour!! Get them while they last! Limited Edition-High Quality, Signed and Numbered Lithographs of both the Samhain Box Cover Art and the Satan's Child Internet CD cover by hyper-real artist Martin Emond. Each litho has been personally signed and numbered by Martin himself and are strictly limited to editions of 300 each. More than suitable for framing and guarunteed to creep out the geek-a-fied, and we all know how much fun that is! The lithos are $75.00 each or order the pair for $100.00 (that's a $50.00 savings! ).